Do you ever wonder why radio stations play the same tired songs over and over again? Or why we’re forced to listen to talk shows while we’re stuck in rush-hour traffic? 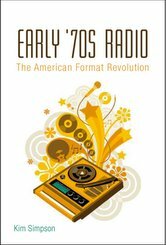 In “Early ‘70s Radio: The American Format Revolution” (Continuum, July 2011), University of Texas at Austin alumnus Kim Simpson (Ph.D. American Studies, ‘05) shares insight into how commercial music radio evolved into what it is today. Providing a comprehensive analysis of a transformative era in pop music, Simpson describes how radio stations began to develop “formats” in order to cater to their target audiences. As industry professionals worked overtime to understand audiences and to generate formats, they also laid the groundwork for market segmentation. Audiences, meanwhile, approached these formats as safe havens where they could reimagine and redefine key issues of identity. In his book, Simpson describes the era’s five prominent formats and analyzes each of these in relation to their targeted demographics, including Top 40, “soft rock,” album-oriented rock, soul and country. The book closes by making a case for the significance of early ’70s formatting in light of commercial radio today. Simpson recently sat down with ShelfLife@Texas to talk about this time of transformation in commercial radio, his fascination with Billboard’s top music charts – and what’s next. What motivated you to write Early ‘70s Radio? First of all, I’ve been a pop music junkie as long as I can remember and keep updated Billboard chart reference books at my bedside. My wife can verify this. When my idea hatched sometime in the late 90s to explore this subject, I’d been keeping “factoid” notes on various hit songs – even the ones I hated. Once I’d gathered up notes about every Top 40 song in 1972, I realized there was much more going on during the much-maligned pop music era of the early 70s than mere silliness. I had also made the discovery around the time that the radio pages of Billboard during the early ‘70s crackled with commentary and general unrest in a way you didn’t see in other eras. Researching Record World and Cash Box, the other two big music biz trades of the day, bore me out. I’d discovered that the early ‘70s represented a very distinct “moment” in both radio history and American culture that certainly deserved its own book. How did you conduct the research for Early ‘70s Radio? Because Billboard had such an impact on how I was now hearing the music of the era, I felt it was a good time for someone to incorporate the trades a bit more aggressively into pop music historiography. Their absence probably has to do with factors like their glaring business orientation, mistrust in the chart ranking process, and their unfashionable “top down” aura in a field more geared toward social history. Another definite factor is that they’re a real pain to find. I had to go to the Library of Congress to leaf through an uninterrupted early ‘70s run of Record World, and luckily the Dallas Public Library was one of few places that held Cash Box. The ephemerality of so much music business source material can really be maddening, so I’m hoping that this book can demonstrate its usefulness, to some extent. Something that requires more record listening, which is where the energy is for me. An encyclopedia-type companion guide to the hit songs of the early ‘70s would be the logical next step. This would allow me to take full advantage of all of my notes and geek out in a way I couldn’t really with “Early ‘70s Radio.” I could shine the spotlight on songs I love but didn’t talk about, like Liz Damon and the Orient Express’s “1900 Yesterday” and Sailcat’s “Motorcycle Mama.” Think anyone would buy it? 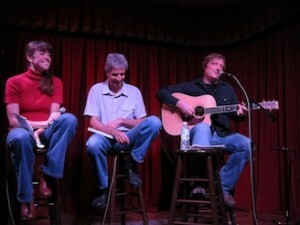 (From left) KUT's Rebecca McInroy, Jay Trachtenberg, and Kim Simpson at the Early '70s Radio "Views and Brews" event at the Cactus Cafe on October 24. About the author: Kim Simpson is a radio show host for KUT’s Sunday Folkways. A critically acclaimed singer-songwriter and guitarist, Simpson taught university courses in pop music and published articles in American Music and Pop Matters. In 2007, he served as a consultant for the Peabody Award-winning rockabilly radio documentary “Whole Lotta Shakin’”. His 2009 CD Mystery Lights: Solo Guitar has appeared in national TV shows and commercials, and his song “Looking for That Girl” (credited to The Mad Dukes) charted in a number of radio trade papers in 2006. Simpson also works in the administration department in The University of Texas at Austin’s School of Law. For more about his work, read his blog Boneyard Media. This entry was posted in Alumni Books, Author Interviews, Staff Books and tagged 1970s radio, College of Liberal Arts, Department of American Studies, Early '70s radio, Kim Simpson, KUT, School of Law by Jessica Sinn. Bookmark the permalink.